Why are these guys unleashing terror on innocent families like this? What do they really want? 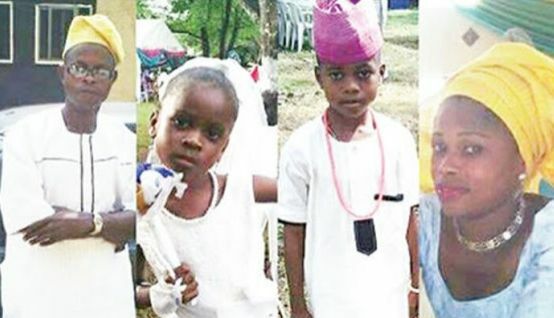 Badoo, a ritual cult terrorising Ikorodu and environs has struck again, killing a pregnant woman, her husband and two of their three children. The death of the family members, who lived in Erunwen, Ikorodu, brought the number of the times that the gang has struck to 8 in 11 months. A whole family was wiped out in some cases. After the latest attack, many residents of Erunwen had reportedly vacated the neighbourhood. The Punch learnt that the victims – Israel Olusanya, 46; Rukayat Olusanya, 37; Wale Olusanya, 11; and six-year-old Semilore Olusanya – were found dead in their apartment on Tuesday, with a bloodstained pestle believed to have been used on them by the assailants. The only surviving member of the family, a 15-year-old Senior Secondary School three pupil, Tolu Olusanya, who sustained facial injuries, is said to be in a critical condition at the Lagos State University Teaching Hospital, Ikeja. It was gathered that a colleague of Rukayat, a teacher in a secondary school in the community, noticed that she was absent from the school on Tuesday. The colleague was said to have checked on her after calls to the deceased’s mobile phone rang out. The visitor, on getting there, found the entire family in a pool of blood and raised the alarm. It was learnt that the attackers gained entry into the apartment after tearing up the window net. They smashed their victims’ heads with the pestle and reportedly cleaned part of their blood with a piece of cloth before leaving. Rukayat’s elder brother, Pastor Paul Oyeyemi, said many residents had fled the community while some landlords, who did not want to abandon their property, were living in fear. He added that their parents had been inconsolable since the incident happened. He said, “Somebody called me on the telephone and said my sister, her husband and their two children had been killed by the Badoo gang. I rushed down there. We took Tolu to LASUTH. She has been stabilised, but she can’t talk now. It was my sister’s colleague in the school that drew people’s attention to the incident. Another resident, Babajide Olanrewaju, lamented the porous entries into the community, adding that traditional rulers in Ikorodu, the state government and security agencies had not taken necessary action to stop the attacks. He said, “The family moved together. You hardly saw them apart. The husband has poultry and a fish pond. The wife’s elder brother (Oyeyemi) is my neighbour. “When my wife told me what happened, I asked her to pack our belongings immediately, and we left the community. Who knows the next target of these people? The spokesperson for Ikorodu Ambassadors Group, Rasheed Fatuga, said vigilance groups had tried their efforts to curtail the attacks. “Community leaders are trying their best to address the situation, but we have not heard from traditional rulers, the local government and representatives in the House of Assemblies. Some suspects have been arrested in the past, but we don’t hear anything about them,” he added. The Lagos State Police Public Relations Officer, ASP Olarinde Famous-Cole, who confirmed the deaths, said investigations had commenced to unravel the perpetrators.